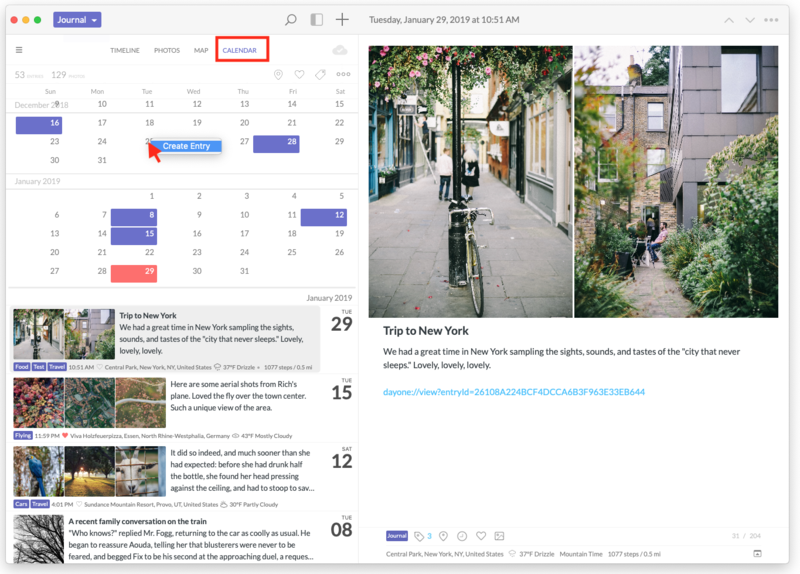 The Calendar view in Day One indicates the days on which you have entries created and allow you to create new entries, view day summary, or view On This Day entries. Tap the Calendar icon at the bottom right to access this view. The current date selection will appear black. The days that have entries will be colored according to your selected journal. Any days that do not have entries will be white. Tap the Calendar icon a second time to scroll back to the current date. Tap on any date to see a few possible entry options. View Day Summary. This will show you any entries created for that same day. View On This Day. This view will show you entries created on this date in past years. On macOS, click the option for Calendar at the top of the Timeline view. Click on any date to see the entries for that date. Right-click (control+click) on any date to Create New Entry on that date.